Frequently-asked questions about technology and digital services in the library. What is an Off-Campus Link? Which Login should I use? All the databases that Lavery Library subscribes to, almost all of which are accessible off-campus. Use "permalinks," "stable links," or "durable links" to an article when saving or sharing them, so they last after your internet session ends. The login page you'll see looks like this. This makes the link work on- or off-campus. With this text to the start of the link, a person who clicks the link can be recognized as an SJFC user after she or he logs in with a network ID (like you use to access Gmail or Blackboard). After logging in, you should be able to get into the database or resource. Why are Off-Campus Links required? Publishers, database vendors, and other information providers license resources to libraries based on the idea that only users at that library's institution can use them. The library provides most of these vendors computer network addresses that identify the college. To use a library resource off-campus, the library has to use this off-campus linking system to authorize that a user is a current student, faculty, or staff member. 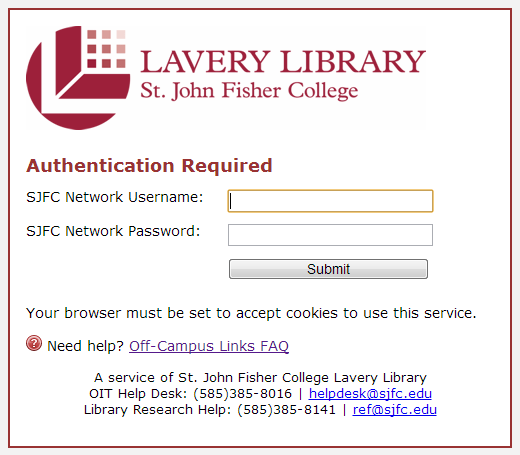 Use your SJFC Network Login (what you use to log in to email or Blackboard). Only use the section of your email address before the @sjfc.edu -- don't use your whole email address for a login. Don't use your Fish'r'net login (your @ number). Because off-campus linking relies relies on many different factors -- the spelling of the link, the linking system itself, and the page you're linking to -- there is a lot of opportunity for an off-campus link to fail. Here are some tips to try if it doesn't work. Does your login not work? Trouble using the password reset system? Contact the OIT Service Desk at oitservicedesk@sjfc.edu or by phone at 585-385-8016. After logging in, does it still not seem to have access to the resource/database? A description of the page you see -- "login required" with a logo for the database, for example? After logging in, do you see a page like this? Creating an off-campus link is easy, but you need to have the spelling of the link just right. This Off-Campus Link Creator can help. Here's a tool to create these links for you. Paste or type a URL address in the box below, and an off-campus access URL will be created. Your off-campus access URL will appear here. Copy and paste this when providing a link to an SJFC user who could be off campus.